The application journey’s a long one – from the first prospectus your son or daughter picks up, to the envelope landing in their hands on results day. Alongside the pressure of revision and exams, staying on top of things can be tough – your encouragement and guidance is going to be vital. As a parent or carer, you can support your teenager by keeping track of key dates, and knowing what’s expected – by us, and UCAS. We’ve summarised that information in this section, and also included some useful links. Take a look at our handy ‘Applying to NTU’ guide which simplifies the university application process. The UCAS Tariff allocates a points value to your son or daughter’s post-16 qualifications. At NTU, we use this system as the basis of our entry requirements – you’ll see a UCAS Tariff points total quoted in the ‘Entry requirements’ section of our undergraduate courses.This helps our Admissions staff to compare grades and scores from a wide range of qualifications – from BTECs, to AS and A-Levels. Achieve this points total, and your son or daughter’s conditional offer will be turned into a firm place at NTU. If your son or daughter’s interested in a particular course, try to make sure they know the entry requirements in full – whether it’s a UCAS Tariff points total, a particular grade requirement, or a combination of the two. Many offers are also conditional of GCSE grade Cs in Maths and English, or certain types of qualifications. So always read the small print – missing or ignoring these details could lead to a wasted application. UCAS will be hosting a series of Higher Education Fairs. These events give our prospective students a chance to meet representative staff and students from NTU. They can discuss their issues, ask questions, and find out about university life. Prospectuses and a range of other brochures and leaflets will be available, to take away. We have put together a list of questions that you son or daughter should be thinking about when attending a UCAS exhibition. It’s open day season. These a great opportunity for your son or daughter to visit universities, tour campuses, talk to subject specialists, and attend lectures and talks on the courses that they’re interested in. I It’s also important to get a feel for the city that the university is located in so make sure to have a wonder round whilst you are visiting. Applications should begin to be started in October and progress can be saved and revisited so there’s no need to complete it all at once. Make sure your son or daughter takes time with their application, ensuring that they have explored all options available to them. Once they have made their choices, it’s important that they spend time building a strong application with a great personal statement. It’s the UCAS applicant deadline – try to make sure that your son or daughter knows the key dates, and that their application’s in order. If we offer your son or daughter an interview, our application advice section is a must-read – here, they’ll find tips on preparing for their interview, and knowing what to expect. Encourage your son or daughter to visit our accommodation pages. If we’ve offered them a place, and they’ve identified us as their firm choice, they can book through our system. For the best and broadest choice of accommodation, encourage your son or daughter to apply as early as possible. We’ll be running our Spring Open Days. Visit us with your son or daughter, and speak with our students and teaching staff. Before committing to a decision, they can find out more details about their course, and NTU. At this point, they should also confirm their funding arrangements, with the Student Loans Company. They’ll need to apply for a loan to cover their tuition fees, and potentially their living costs. They should check to see if they’re eligible for any NTU-funded scholarships, or bursaries, too. This month, your son or daughter should reply to our offer. Applicants must reply to offers by 4 May if the last decision from universities and colleges was received by 31 March (except those living overseas and or applied through Extra). Although applicants who don't fall under this group (e.g. those who do not receive decisions on all applications by 31 March) only need to reply to their offers by 2 May. Exam time. Help your son or daughter to prepare, by visiting our advice and guidance section on exam stress – they’ll find a range of tips for dealing with the stress of revision and exams. Clearing and Adjustment opens at NTU in early July. If your son or daughter has their results already, they can get in touch with our Admissions team to discuss vacancies. It’s A-level results day on Thursday 16 August 2018. If your son or daughter hasn’t quite got the grades they expected, get in touch with our Clearing team – alternatively, if they’ve surprised themselves, they can apply for Adjustment. We’ll quickly send out enrolment, induction and Welcome Week information to those who’ve confirmed their place. If they haven’t already, your son or daughter should complete their accommodation booking – after they’ve received their results, they can go to the accommodation section of our site and complete their booking. We welcome our new students to NTU. Our Welcome Week runs from Friday 21 September 2018, and is full of activities and opportunities to meet new people. Term starts on Monday 1 October 2018. Here’s a summary of what your son or daughter can expect to hear from us, across the stages of their application. If they’ve already provided their details to us, they’ll join NTU’s mailing list. Our emails and letters are a great way to keep in touch, and up to date – they include news stories, offers, and invitations to our open days. Try to make sure that your son or daughter’s contact details are up to date with UCAS. If your son or daughter receives an offer from NTU, it’ll come with a detailed information pack – after attending our open days, they should now be getting to grips with the subject and the university, and nearing a decision. They’ll also start to receive information that’s more specifically relevant to their course – this includes invitations to tailored open events, for individual Schools. They’ll have the opportunity to meet with NTU students and teaching staff, and really get a sense of what’s on offer here. As the UCAS deadline approaches, we’ll send your son or daughter a courtesy reminder – at a busy time, this ensures that they reply to our offer. 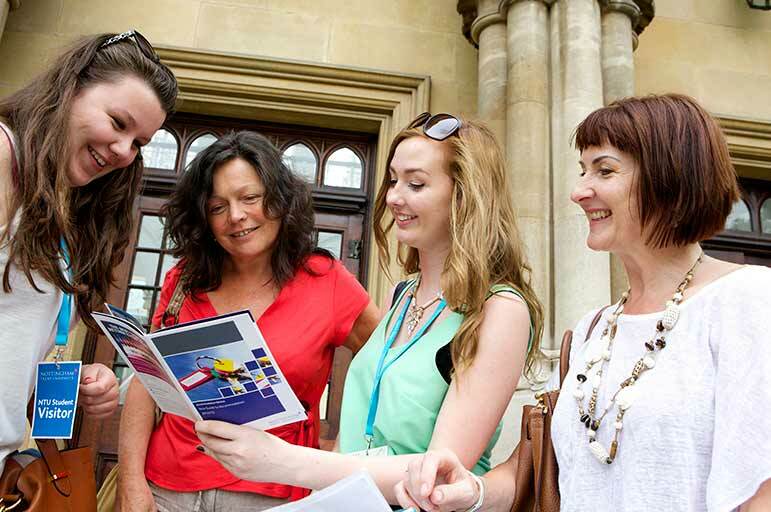 If your son or daughter’s met the conditions of our offer, we’ll be emailing them to confirm their place at NTU. We’ll send this confirmation through the post, too, along with our Starting at NTU guide. Our Welcome Week team will also be in touch – so again, make sure that their contact details and postal address are up to date with UCAS. The email and letter will be issued as soon as possible after results day – keep them safe, as they’re official documents, and they’ll explain what to do next. If your son or daughter’s worried that they’ve missed a letter or email, our Admissions team can be contacted on +44 (0)115 848 4200.